At this time of the year in Northern Europe the Belgian endive is making its annual appearance, and it stays most of the winter. It is one of my winter go-to vegetables because it is locally grown, a good keeper and extremely versatile. It can be used in salads but is also lovely braised, grilled, roasted or, as in this recipe, as the star of a delicious tart. 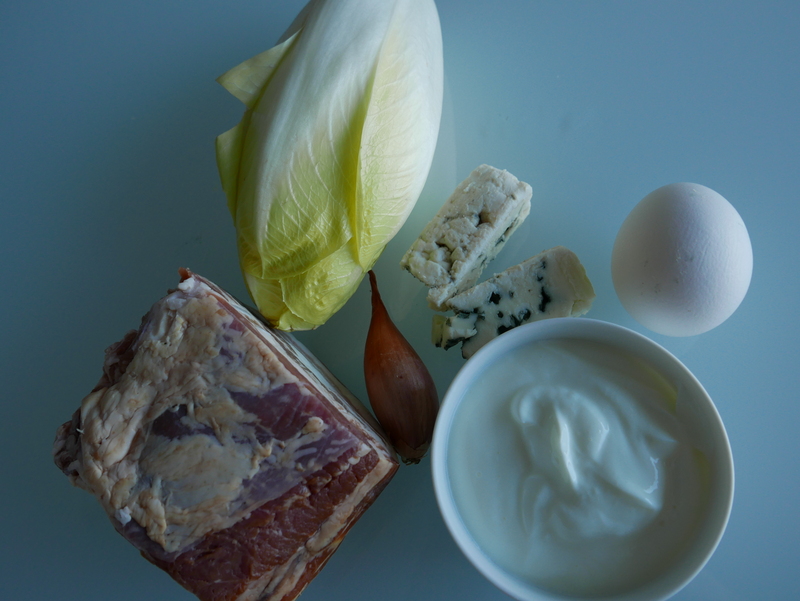 Belgian endive is easy to grow if you can get your hands on some chicory root. It is basically a chicory root that has been given a reboot; a chicory sprout. After the chicory is harvested the roots are simply dug up, trimmed and re-planted in a dark place. There they will sprout all winter long. At Petraia, I used to grow a lazy man’s version by simply cutting the chicory leaves off evenly at the base of the stem as I harvested. I left the roots in the ground and covered them with planter pots that keep the light out. 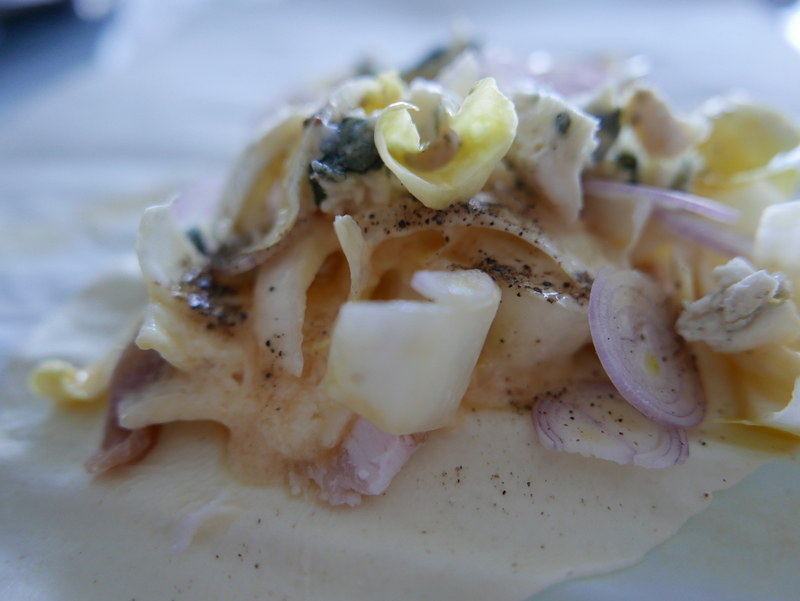 Tender, blanched endive leaves sprouted all winter. If you live in an apartment you can grow these indoors in a cool spot in a covered pot. Or, if you live in a house, you can grow them in your basement or root cellar. 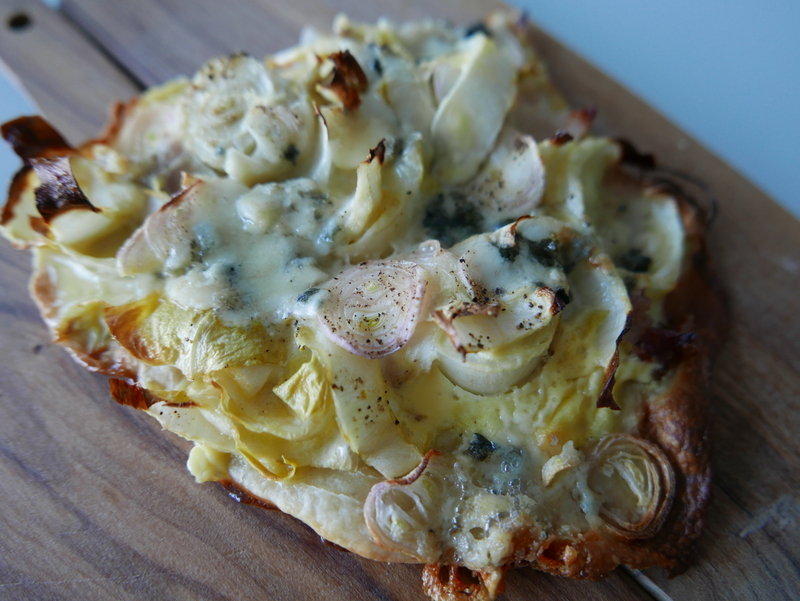 This savory tart is a simple one and the pastry is also very interesting. Quark pastry, while not part of the classic French repertoire, is quite common in German speaking countries and also in Scandinavia. Like puff pastry it puffs up in the oven, is very light and contains a lot of butter. But it also contains a lot of quark and that is what makes it so surprisingly light. Quark is an acid-set fresh cheese (as opposed to a rennet-set cheese) and its made from soured milk or buttermilk. It usually comes in a full fat and a low-fat version. If you can’t find quark in your grocer, its easy to make. Unlike puff pastry, quark pastry is not a laminated dough. It is a quick and easy blender pastry and takes just a minute to make. It will keep in your fridge, wrapped in plastic for days. The recipe is simple, 1 part flour, 1 part quark, 1 part butter, a pinch of salt. If you don’t like roquefort you can use smoked bacon or pancetta instead for a delicious variation. Or as I usually do, make one of each. This is a free-form tart. The pastry is rolled out thin like a pizza and the ingredients piled on top. Unlike most pastry recipes which often have a lot more flour than butter or other fat this pastry is mostly butter and quark, and only ⅓ flour. The result is a sticky dough which firms up a bit in the refrigerator after it is made. Your quark should have a fat content of around 4.5%. In Europe this is usually labelled as low-fat quark. Place the flour, cold butter quark and salt in your blender and pulse for a few seconds to combine the ingredients and then process for about 20 seconds until smooth. This dough will be sticky and will not come together in a ball like regular tart or pie dough. Scrape the dough out of the blender and wrap it in plastic. Refridgerate for 1 hour or overnight. Place the pastry on a sheet of parchment and cover it with a sheet of plastic wrap the same size as the parchment. The plastic will keep the dough from sticking to your rolling pin and allow you to avoid having to flour this tacky dough. Roll out the dough as thin as you can then remove the plastic. 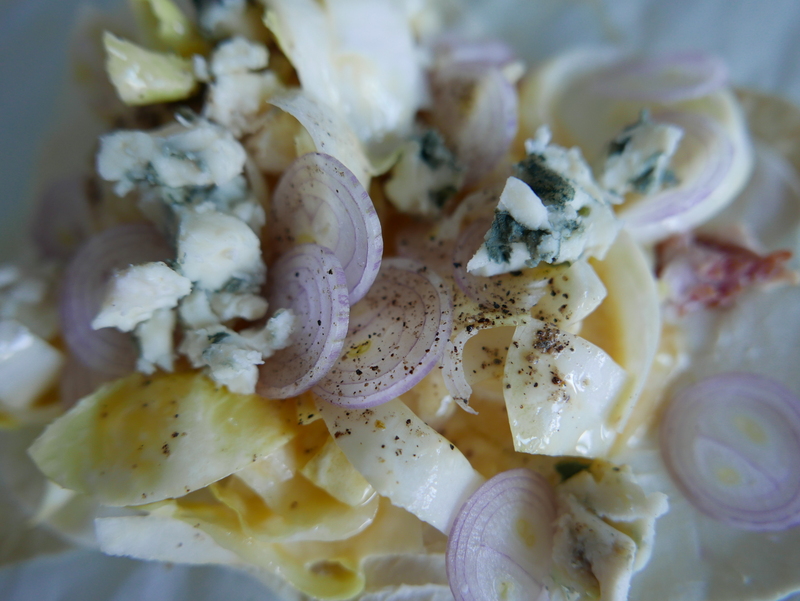 Combine the endive, shallot, beaten egg and quark in a bowl and spread over the tart, then top with the roquefort. Transfer to a baking sheet and bake for 15 minutes or until the pastry is golden brown and the filling has set. Variation: For a smoked bacon and endive tart substitute 1 ounce of smoked slab bacon, cut into small dice (lardons) for the roquefort.